The tour is over. We’ve got home, unpacked our bags and are resisting our instinctive urges to flyer ever single person we see. 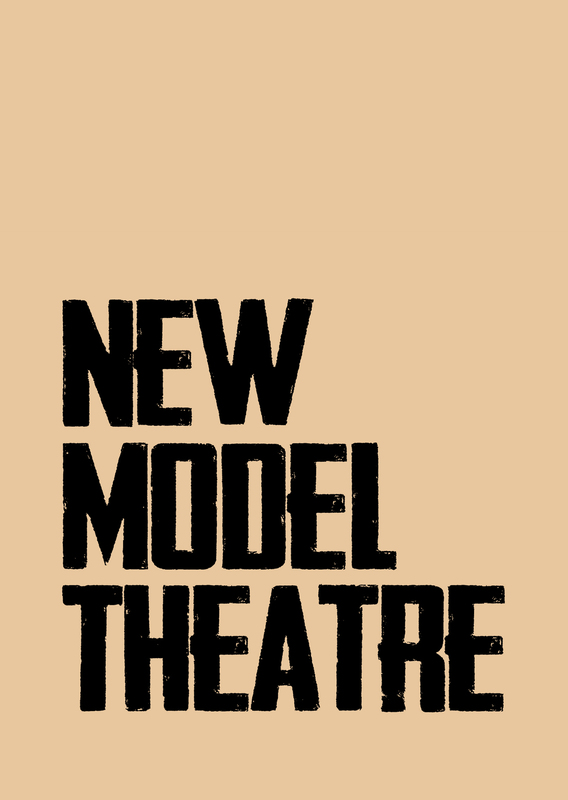 This year’s tour was a massive step up for New Model Theatre. 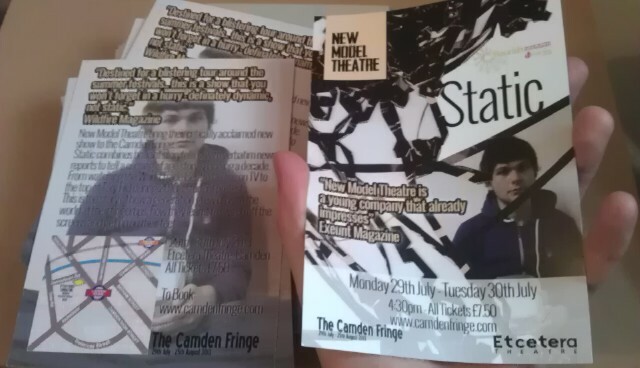 When we started rehearsing Static we had a vague dream that we might take it to the Edinburgh Fringe, and perhaps not so much knowledge of how we might do so. What we ended up doing was undertaking a 28 day tour (that’s a whole February’s worth) that let us share our little show with audiences in Exeter, Manchester and Camden before finally heading up to perform as one of the 2,871 shows at this year’s Edinburgh Festival Fringe. We had some amazing successes along the way. 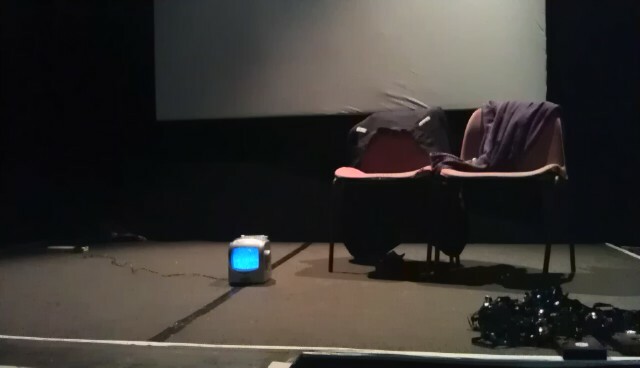 We opened to fantastic, receptive, almost-hometown audiences at The Bike Shed Theatre in Exeter. The Guardian interviewed the both of us for an article about the Greater Manchester Fringe in which they described the show as “Brilliantly executed, with a clever script and a sterling performance from McCann.” Prior to Edinburgh we were featured in an article in The Observer about a new wave of political theatre at this year’s fringe. And to round it off we were awarded Four Stars by Edinburgh Festival critics Three Weeks. We’ve also had some down points. Sometimes, in cities newer to us, audiences weren’t quite what we hoped. In Edinburgh there were a couple of nights when we fought with technical faults (although we still had some lovely feedback from audiences). And, whilst watching some (extremely funny) comedy in Camden, we had to sit in an audience with Boris Johnson. What’s been fantastic about the whole experience has been the people we’ve met along the way. We’ve had some fantastic discussions with audience members about the show which have really influenced the way we see it ourselves. The staff at every single venue that hosted us were extremely friendly and supportive. And finally the other companies and artists that we’ve met in each city we’ve visited, it was great to share stages with each and every one of you. There’s a few people that we owe a huge amount of thanks to as without each of them the show would never have been as successful as it was. Huge thanks to the Barbican Theatre, Plymouth who gave us the time and space to develop Static (and who’s hot-desk I’m currently writing this on), it was a massive boost to us having such a well-respected organisation behind us. Thanks to Chloe, David and all at the Bike Shed Theatre, Exeter for supporting us through our ‘In Your Space’ residency. Thank you to David Prescott of Theatre Royal Plymouth for giving feedback on numerous drafts of the script, and to Exeter writing-legend Nick Discombe for ensuring the show got written in the first place. If you’d like to support our future work by making a donation this goes a long way to ensuring we can continue to create high-quality productions in the South West. All donations are gratefully received. This entry was posted in Static, UK Tour 2013. Bookmark the permalink.